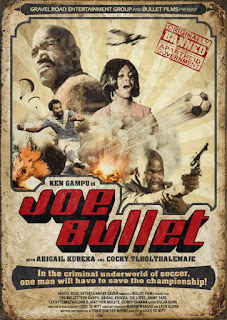 Tag line: "In the criminal underworld of soccer, one man will have to save the championship"
The fact that 1973’s Joe Bullet resurfaced at all is a miracle in and of itself. Produced in 1971, it was one of the first South African movies to feature an all-black cast, and after only two public screenings the film was banned by the country’s Apartheid government (according to writer / producer Tonie Manwe, one of the many reasons given for the ban was it showed a black man driving a sports car in an upper-class neighborhood). Following an appeal, the ban was reversed, but Joe Bullet never screened again, and sat on a shelf for well over 40 years. Thanks to the gang at Gravel Road Entertainment, the original print of Joe Bullet has been remastered, giving the film a second life on DVD while, at the same time, providing viewers with a unique perspective of South Africa at a very tumultuous time in its history. A mysterious crime lord and his cronies are trying to fix the championship soccer match between The Eagles and The Falcons, which is only a few short days away. After killing the Eagles’ trainer (Richard Khumalo), the mob threatens the team’s two best players, Flash (Cocky Tlhotlhalemaje) and Jerry (Sydney Chama), warning them that if they don’t agree to play for the Falcons instead, they’ll never make it to the stadium alive. With nowhere else to turn, Flash asks his good friend Joe Bullet (Ken Gampu), a master marksman and kung fu expert (who’s also handy with a knife), for help. Joe agrees to watch over the team, and before long has the mob on the run. But this crime boss has deep pockets, and hires a professional assassin (Matthew Molete) to eliminate Joe Bullet once and for all. As the assassin and the mob will soon realize, however, getting the upper hand on a guy like Joe is easier said than done. A low-budget crime / thriller, Joe Bullet is definitely rough around the edges. At times, the pacing is lethargic, and some of the action sequences are pieced together haphazardly (as a result, one of the big fight scenes, which takes place on a train, doesn’t generate the excitement it should have). In addition to its cinematic limitations, the film features a scene that is sure to turn off a good number of people: the actual killing of an Egyptian cobra (while not nearly as graphic as the animal deaths in Cannibal Holocaust, it’s still tough to watch). But the snake wasn’t the only one hurt during the making of this film; a late sequence involving a rolling barrel put star Ken Gampu in the hospital for two weeks, and damn near killed him! On the plus side, Joe Bullet contains a handful of pretty nifty scenes, the best of which has Joe rescuing the Eagles’ team president (Dan Poho) and his daughter (Abigail Kubeka) from their car, which is almost swept away by a raging current when explosives (planted by the mob) destroy a nearby dam. As for Ken Gampu, he may not be the most charismatic action star you’ll ever see, but he has a good screen presence and handles himself well enough in the lead role. On top of this, the movie was shot on-location in areas of Johannesburg that were rarely explored in films from this era , and the movie’s awesome title song (recorded by a group called The Silver Threads) will be rattling around in your head for hours (“Joe… Bullet. Joe… Bullet. He’s the man… the man who fights evil”). Yet the truly wonderful thing about Joe Bullet is that it’s once again available. Over 40 years have passed since this film was last seen by an audience, and in the DVD commentary, writer / producer Tonie Manwe said that, for the longest time, he believed it was lost forever. But it wasn’t, and it is discoveries like this that make being a cinephile so rewarding. In a way, watching Joe Bullet is like finding a hidden treasure, one that lives and breathes with the spirit of the time and place in which it was made. I can’t help but wonder how many other lost films are out there, sitting in garages, attics, and warehouses, just waiting to be found. It sets the mind to spinning, doesn’t it?